Seduction is an elegant fishtail gown in six different seductive shiny colours. The top is partly transparent in the middle with a lace pattern. The skirt has three parts for the fishtail. This week Ella is offering you one of the posh bikinis ” Stella” in pink. Please note that only the pink one will be on offer for 60 LS. All the other colours are still 149 LS. 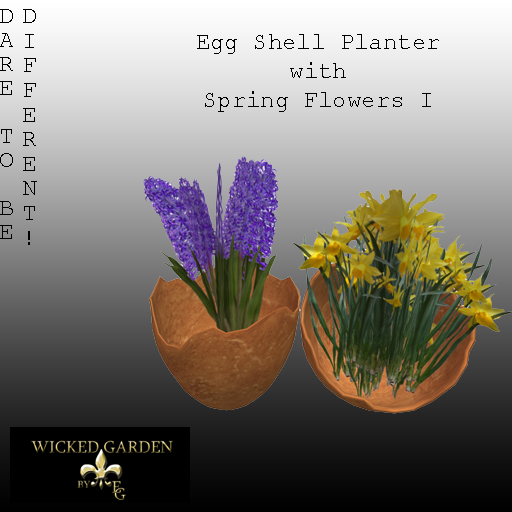 to make your easter events a great experience the *Wicked Garden* is hosting a few events for you. As you all know the *Wicked Garden* was one of the first shops to host the Lucky Tribe events. Since ever we are taking part in all the Lucky tribe events throughout the year, yeah! So we are happy to tell you that we are participating in the Lucky Tribe Easter Egg hunt. In brief: Go to the Lucky tribe HQ, get the hud, join the group and start collecting your kudos. Change them to the special Lucky Tribe gifts at all the prize redemtion spots. For more information read the official Lucky Tribe notecard. You all asked me to take part in this event, so from today on I am taking part in the 60 Linden Weekend event. Jerone Egg Shell Planter with spring plants. Very low prim – 4 prims only. So it fits perfectly to your Linden Home! 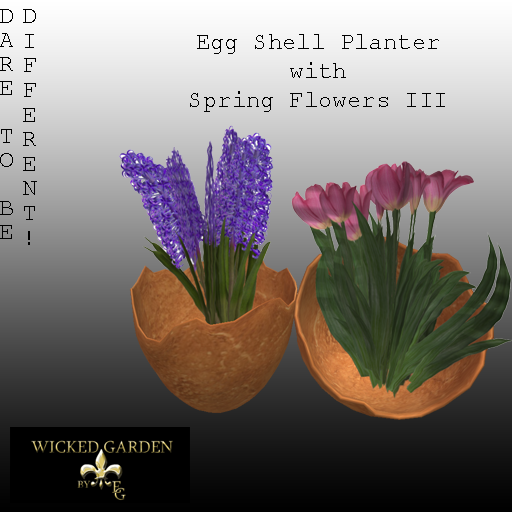 Secret event for easter coming up on the 4th… shhh don’t tell about the sl egg hunt…come here, collect your eggs and win lindens. 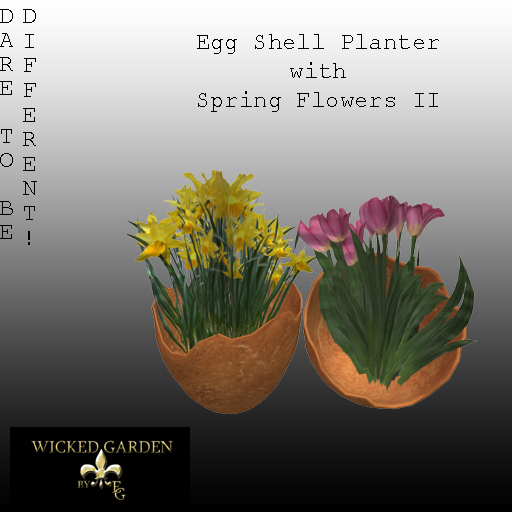 There are 7 eggs hidden at the *Wicked Garden*. Those will be put out during the hunt. So get here every week and look for the hidden egg. This event is gid wide and huge fun.